It’s a feast of the senses. Warm air on my skin. The sweet smell of almond croissants—alarming numbers of calories beckoning, reluctantly resisted—waft from the French bakery. Bass notes thud from several houses, random patterns until I am close enough to hear the melody. I pass trailers craddling gleaming powerboats: Pure Pleasure, Wet Dreamz, Drippin’ Wet, and Royal Seaduction (notice a theme here?) The gentle return uphill gradient calls for a quick dip in our pool. As I cool down I hear the clamor of bananaquits on the veranda railing gobbling up the raw sugar we’ve set out for them. The warmth I feel during my walk doesn’t just come from the slanting rays of the morning sun. Every day, another kind of warmth envelopes me; the warmth of the people I meet. 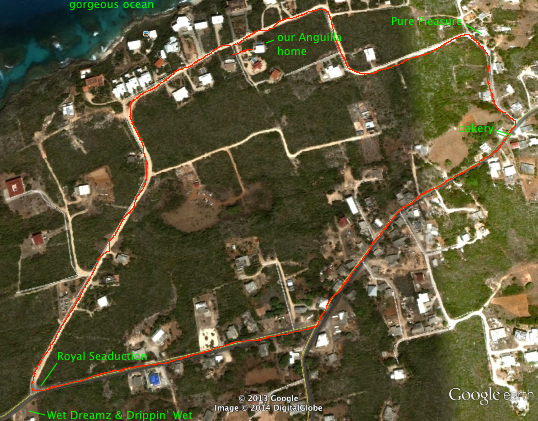 This entry was posted on Monday, February 17th, 2014 at 6:30 am	and is filed under Connection, Lessons from Anguilla. You can follow any responses to this entry through the RSS 2.0 feed.You can leave a response, or trackback from your own site.